In early April, 1982, Argentina invaded the Falkland Islands, a few desolate rocks in the South Atlantic. The British mobilized their fleet, sending it south by way of Ascension Island. 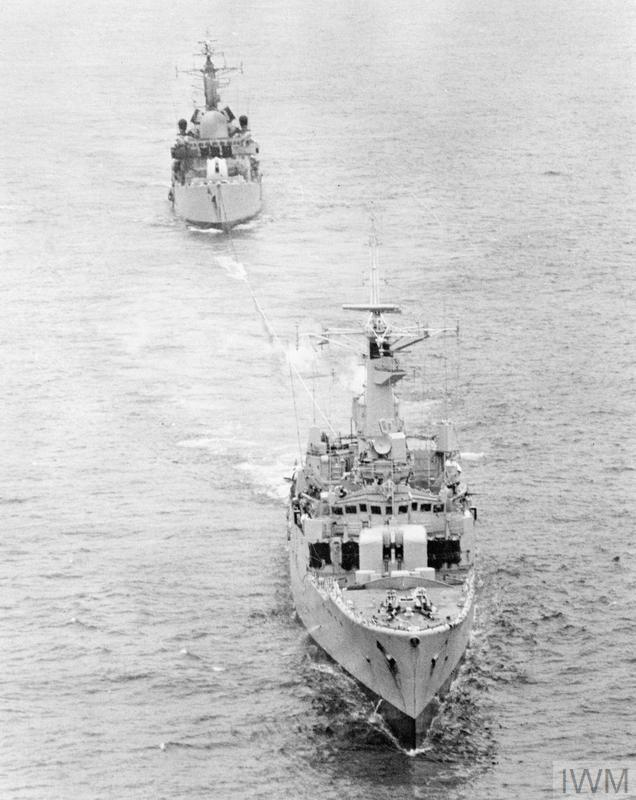 On the 25th, a force retook South Georgia, a even smaller and more desolate island that Argentina had also captured, while the main task force closed in on the Falklands. May 1st saw the British launch their attack. The Argentine Navy tried to interfere the next day, but withdrew after the cruiser General Belgrano was sunk by a submarine. May 3rd was quiet, but May 4th was not. The day began with the second Black Buck raid. While everything went smoothly, the string of bombs fell 600 yds wide of the runway, doing no damage to any of the airport facilities. The carriers closed in on Stanley during the night, planning another set of raids. Harriers flew off for CAP, while the three Type 42 destroyers, Glasgow, Coventry and Sheffield, moved further west, deploying down the threat axis about 20 nm from the carriers in a line 40 nm long. By this point, the fleet was beginning to treat the matter as routine, and at Air Raid Warning Yellow,1 procedure was to be at Defence Watches, with half the crew at their stations. When Air Raid Warning Red was sounded, the entire crew would go to their battle stations. The good performance of radars on May 1st had given them confidence to justify this procedure. There wasn't much air activity for them that day. The Argentine Air Force was still licking its wounds, while the majority of the Naval Aviation units were still aboard Veinticinco de Mayo. The only exception were the Super Etendards, with their AM39 Exocet missiles. Five of these weapons had been delivered before war broke out, prompting a French embargo.2 This included the technical aid necessary to integrate the weapons onto the Super Etendards, so the British believed that the only threat was from iron bombs.3 In fact, the Argentines had somehow managed to do the integration themselves, probably with the aid of Israeli technicians in-country for other projects. When a patrolling P-2 Neptune picked up British ships at 1050,4 two Super Etendards were scrambled, each with a single Exocet. A KC-130 tanker was also dispatched to ensure they could reach the Task Force, escorted by a pair of Daggers. About three hours after the first sighting, around local noon, the Super Etendards approached the destroyers. They were flying very low, hoping to stay below the radar horizon.5 The plan was to pop up briefly, do a radar scan to locate the target, then fire and turn away. Glasgow. The UAA system is visible just below the top of the mainmast. At 1356, Glasgow's UAA ESM system6 picked up three sweeps that it identified as coming from the Agave radar of the Super Etendards.7 Glasgow sent a warning over the fleet's radio network, and picked up two more sweeps a minute and a half later. This was followed almost immediately by a radar contact on the two aircraft, and Glasgow reported the two contacts over voice radio and Link 108 at 1400. At this point, Glasgow ordered Action Stations, and fired chaff. Unfortunately, the attack caught Sheffield unprepared. 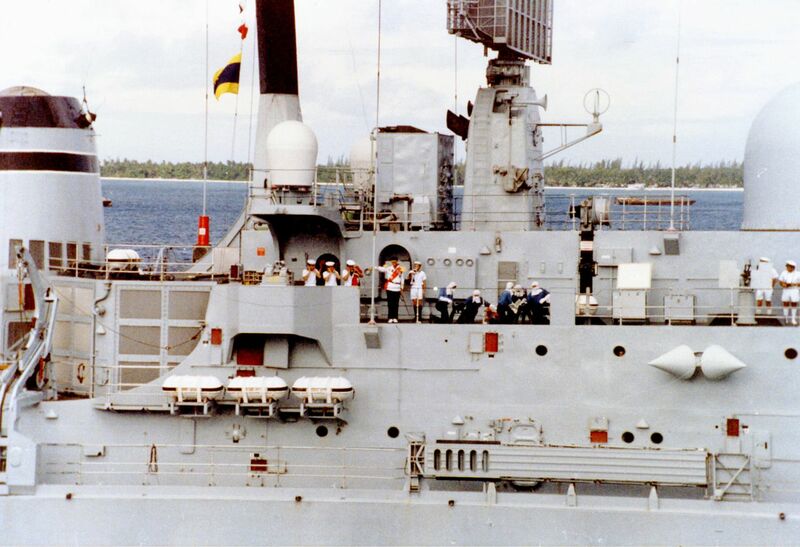 She missed the radar sweeps, as she was in the process of using her SCOT satellite communications system, which required the UAA ESM system to be shut down.9 There was a shortage of qualified tactical officers aboard, and the watch officer had stepped out to go to the head, presumably believing that the ship could not really operate with the ESM system offline. The AA Warfare Controller on Invincible evaluated Glasgow's reports as more spurious contacts, and Sheffield did not go to Action Stations. Sources differ on whether her radars even picked up the strike aircraft. Sheffield with Sea Darts on the twin launcher between the 4.5" gun and the bridge. A minute after launch, one of the missiles hit the destroyer on the 2nd deck starboard, between the galley and the machinery rooms and about 8' above the waterline. The other one missed and flew onward, eventually falling into the sea a minute or so later near the frigate Yarmouth. The impact was immediate and catastrophic, despite the fact that the warhead may not have detonated.11 The remaining rocket fuel, which contained its own oxidizer and could not be extinguished, spread fire throughout the Auxiliary Machinery Room and the Forward Engine Room. Choking smoke shrouded the ship, and the crew were forced to use emergency pumps due to a rupture in the fire main. One generator continued to function, supplying the electrical power needed to keep the ship alive. Unfortunately, communications were knocked out immediately, and the Task Force didn't know what was going on aboard Sheffield until a nearby Sea King lowered its sonar operator onto the bow and got a report. 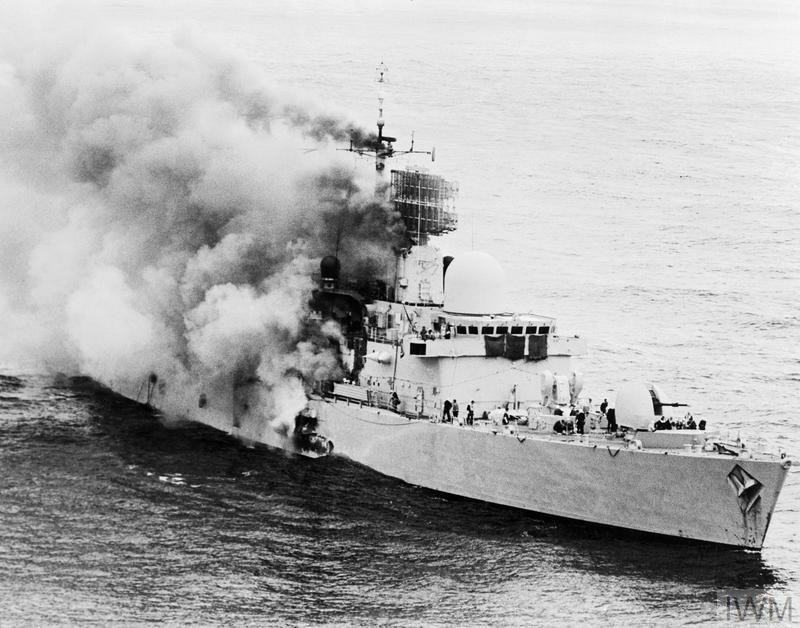 The crew of the stricken destroyer fought back, attempting to contain the fires, save their fellows who were wounded or trapped in burning compartments, and keep the ship able to fight. The crew of the computer room, vital to Sheffield's ability to defend herself and the other ships, stayed too long and were overcome by smoke. The frigates Arrow and Yarmouth came alongside, providing power, firefighting water, and medical facilities. Reports of submarine attacks drew Yarmouth off twice, but no evidence of an actual submarine attack was found. Despite the efforts of all three ship's crews, by 1800, four hours after the attack, the writing was on the wall. 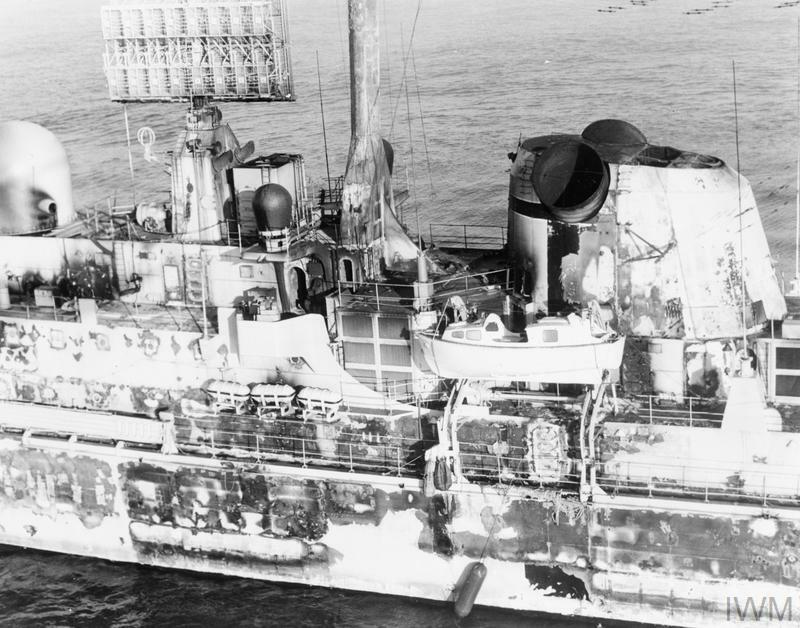 The last generator had died, the spreading fires had done enough damage to remove any chance of bringing the ship back into action without a full refit and now menaced the magazines for the Sea Dart and 4.5" gun. More than that, the weather was now perfect for another Argentine air attack, and Captain Salt of the Sheffield worried that he was tying up too many of the Task Group's assets. 266 men were taken off, leaving twenty of their shipmates behind forever. Sheffield remained afloat for the next six days, in the hope that she would absorb Argentinian air or submarine attacks that otherwise might damage a valuable ship. Several surveys were made during that time, to evaluate the possibility of saving the hull, and to gain information about the effects of weapon attack on a real ship. Orders were issued to tow Sheffield to South Georgia, but when Yarmouth attempted to do so on May 10th, water began to enter through the gash in the hull, eventually sending her to the bottom. So why was Sheffield lost? Much of the blame must be laid at the feet of the British procurement system, which was often more concerned with controlling cost than producing effective weapons. 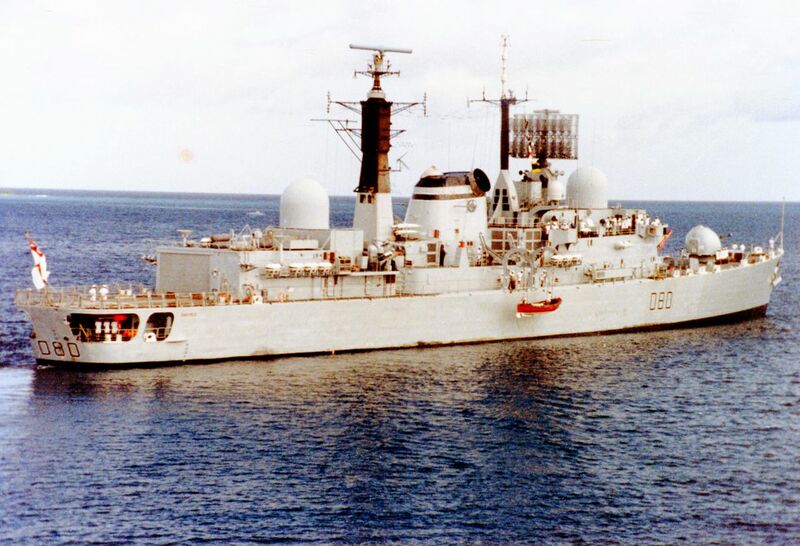 The Type 42 was essentially the minimum viable Sea Dart ship, with many systems deleted to keep cost down. The ships were originally built without UAA, and at the time of the action, they had neither defensive jammers nor any form of point-defense weapon. A Phalanx CIWS would probably have shot down the Exocet, and they were rapidly procured in the aftermath of the war. The drive for economy had other, less obvious, effects. Size had been restricted to remove the temptation to add extra systems, which meant that the UAA was close to the SCOT. A bigger ship would probably have been able to operate her ESM system at the same time she talked. Likewise, damage control standards had suffered, and inadequate smoke barriers hindered the crew's firefighting efforts. On a larger level, the lack of an Airborne Early Warning system flying from the carriers meant that the Super Etendards were able to approach undetected and unchallenged by the Harriers flying overhead. But there were also serious failings on the part of the crew. Glasgow reacted promptly to the detection of the attackers, while Sheffield took little advantage of the warnings provided. Until the missile hit, the British had lost nothing more than expended fuel and ammo, and complacency had set in. The British had planned to launch an attack on the airfield at Goose Green, although it was delayed several hours by the need to keep Harriers on CAP. Eventually, three aircraft were dispatched on a low-level attack. One of them was shot down by the AA guns stationed around Goose Green, another rude shock to the British, who were still seriously concerned about maintaining air superiority. They would have to be more cautious during the next phase of the war, as they waited for the amphibious group to arrive. A few questions: -Should the CAP have been expected to spot the Neptune and/or the Super Etendards? If so, why didn't it? -Were Glasgow's reports just sharing sensor data, or did they contain a determination that the alarm was not false? 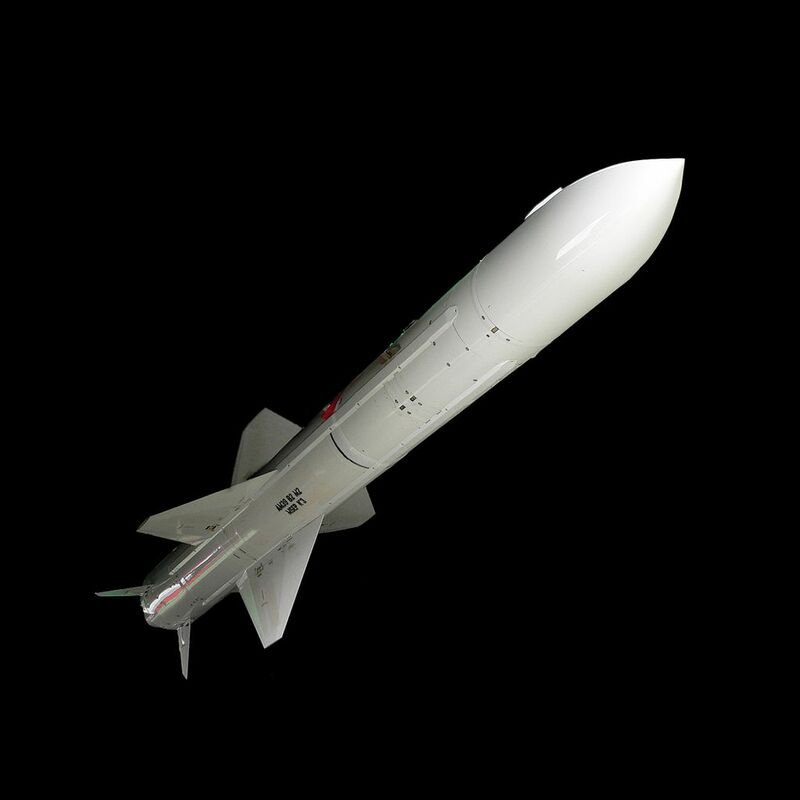 -Would the Sea Darts have had a good chance of shooting down the missiles if the UAA was operating and the crew at stations at launch time? -Did the 20mm guns have any hope of working? Is it known if they were crewed? -What possibility, if any, existed of one destroyer providing missile defense for another--either in the action as it occurred, or in hypothetical alternate formations? -Was this a particularly impressive performance by the Argentine pilots? That's a lot of questions, but I'll do my best to answer them. As I said in the OP, there were some things that weren't entirely clear from the public data, and some of my sources flatly contradicted one another. Nobody has written a definitive account of this action yet. -Should the CAP have been expected to spot the Neptune and/or the Super Etendards? If so, why didn’t it? Probably not. The Sea Harrier's radar wasn't great, and it was mostly designed to hunt large maritime patrol aircraft. It definitely didn't have a good look-down capability, which would have been needed against the Etendards, and I think the Neptune was too far away for them to risk sending the CAP off. -Were Glasgow’s reports just sharing sensor data, or did they contain a determination that the alarm was not false? It wasn't directly sharing sensor data. Even modern data links can't do that. Nobody puts out a known false alarm, and I don't have the data to figure out what every did know and should have done. -Would the Sea Darts have had a good chance of shooting down the missiles if the UAA was operating and the crew at stations at launch time? Another thing I'm not sure of. The only Sea Dart vs missile engagement I know of was a success for the Sea Dart, but that was a decade later, presumably with a lot of electronics upgrades. My very rough estimate is that they might have had a 40% chance. That said, if they'd been on higher alert, they might have gotten a chaff salvo off, which probably would have worked. -Did the 20mm guns have any hope of working? Is it known if they were crewed? Not really and not sure. -What possibility, if any, existed of one destroyer providing missile defense for another--either in the action as it occurred, or in hypothetical alternate formations? In the formation as it was set up, there wasn't much chance. They were spread out too much for that given the limitations on Sea Dart, AIUI. In other formations, there was at least some possibility, and later on, Type 22s were assigned with the Type 42s to provide point defense with their Sea Wolf missiles. That usually worked reasonably well. -Was this a particularly impressive performance by the Argentine pilots? No. They popped up, took one look, and shot 40% of Argentina's stock of Exocets at a single target of unknown identity. It could have been Invincible or Hermes, but probably wasn't because those kind of ships aren't usually in the front of a formation. It could also have been a helicopter with a blip enhancer, or a cloud of chaff. Speaking of unknown identity - I hope you will discuss, at the appropriate time, why the Argentinians were so convinced they had sunk Invincible. In the Official History of the Falklands Campaign, Freedman basically says momentary fog of war is one thing, but the degree of delusion on this matter is inexplicable. My guess is that it's an extreme case of drinking their own cool-aid. 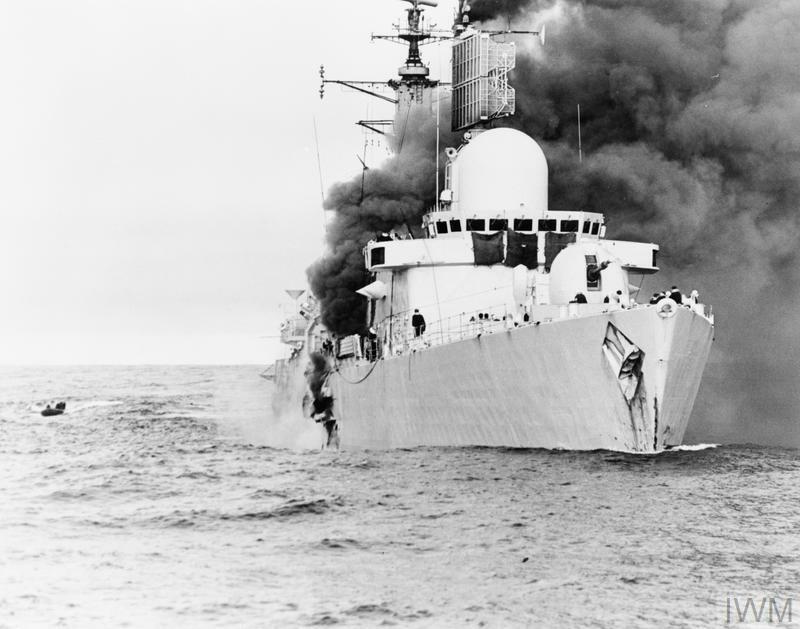 That attack took place on May 30th, when the British were halfway across East Falkland and the war was not going well for Argentina. Avenger got turned into Invincible in the pilot's minds, but weirder things have happened. Then they got home, debriefed, and the Junta needed a propaganda triumph. So they took what they could get, and probably believed it for the first day or two. Then they kept spouting it because things kept getting worse for them. I looked through the section of the official history on the Sheffield (thanks for reminding me about that, BTW) and it indicated that Glasgow was somewhat reluctant to put the ESM contact out and the air warfare coordinator on Invincible refused to verify it primarily because they didn't have a second contact to confirm it was real. The obvious source would have been Sheffield, but her UAA was offline. I may revise the OP slightly, as it's increased how much I think Sheffield's crew was at fault at least a bit. If you look back at the history of modern sea battle, particularly when planes are involved, there's a long history of everyone dramatically overestimating targets sunk. Some were worse than others, the japanese were particularly terrible, but everyone does it to a degree. If you look back at the history of all warfare ever there is a long history of everyone dramatically overestimating the number of enemy successfully destroyed. I just ran across another account of the Sheffield sinking, this one from a radar operator on Invincible. He claims to have picked up the Etendards coming in, and his officer dismissed them. If it's true (time plays tricks on memory), then said officer, and the AAW staff on Invincible, screwed up really badly.